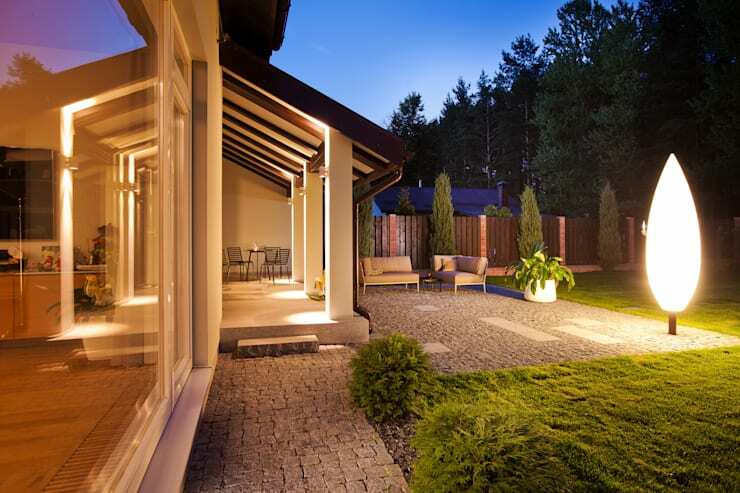 Today on homify, we present an exquisite modern family home with a pristine garden space. Lighting is standout a feature in this property, while space is also maximised with some clever tricks and features. Throughout our tour we will observe contemporary decor and furnishings with a leaning towards minimal and modern Nordic styles. So let's scroll down and see what all the fuss is about! In summer, when the weather is good enough, we might very well bring out the sunbeds and couches to spend some relaxing afternoons in the garden. This pristine lawn adds so much colour to the front of the house. It says to people that this property is cared for and maintained to the highest standards. It's a first impression that leaves a mark of quality. We love the little shrubs lining the path under the living room window, too. Stepping stones, neatly pruned hedgerows, and immaculate grass! Clearly the work of a talented landscape architect who knows how to create a welcoming garden. 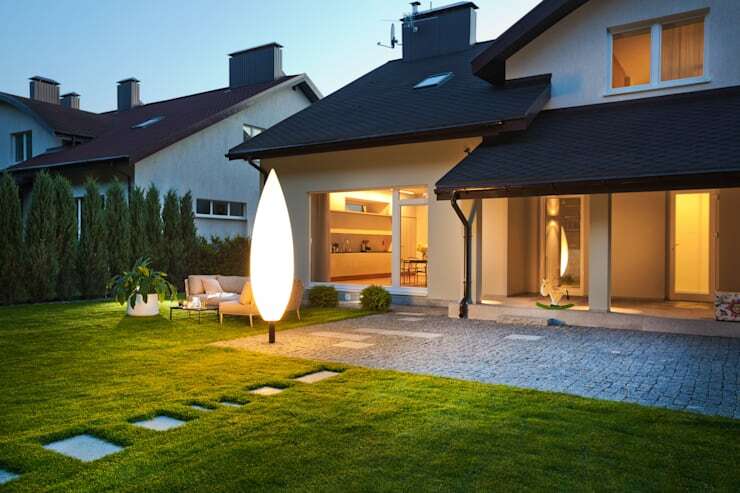 Notice the unique inverted teardrop light feature, which enables the owners to sit outside and enjoy the summer night for longer. The paved backdoor area also provides another place to unwind, or perhaps work on another project. This protruding roof gives a handy shelter for the raised porch area, and yet another place to relax when the sun is too strong or perhaps when the gentle summer rains fall. The back garden is large, and the cobbled stones are a beautifully classic touch. Everything here has been well planned and thought out, with the effect tranquil and tidy. A haven for the parents and children alike! 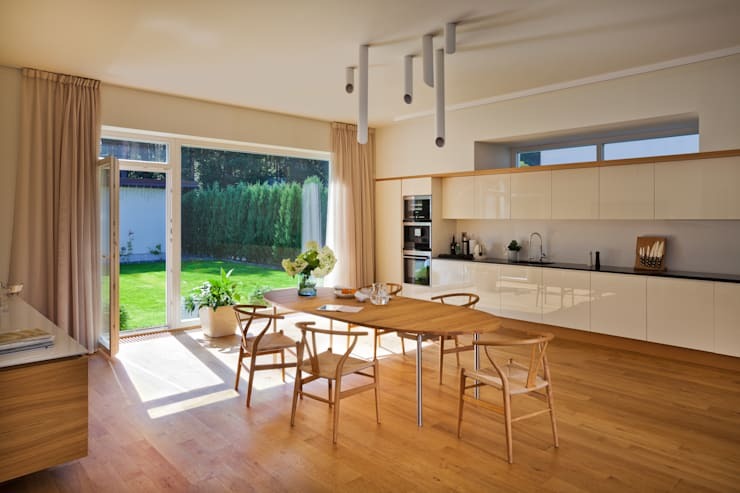 Rather than separate it into two smaller rooms, the architect has chosen to keep this area open plan and wide. The kitchen is one long stretch of counter and cabinets, with appliances built into the wall to maximise space. 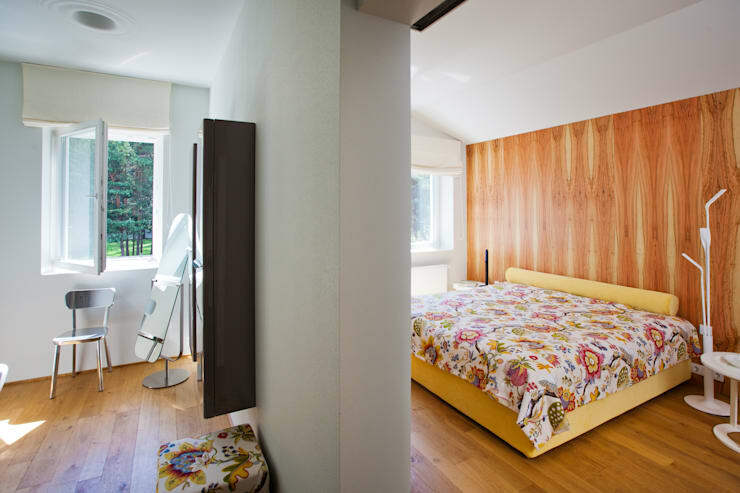 The glorious wooden floor is a warm colour which feeds the energy of this room. Cream and wood are known for creating a pleasant, relaxed vibe, while the large window gives an excellent view of the garden and allows a large amount of light to fill this room. Minimal and spacious! Here we see a wonderful amount of light flooding through the window and bouncing off the white walls. The effect is bright and cheerful. Complete with bidet, toilet and sink, this Mediterranean-style bathroom is supremely simple and functional; easy to maintain, clean and enjoy. 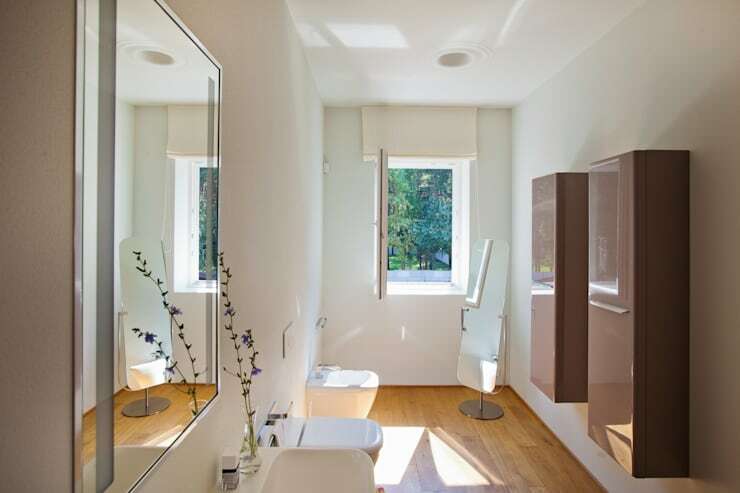 The en-suite bathroom is separated by a sliding door rather than one which opens in or out. There's some terrific sunburst wooden paneling behind the bed, adding serious design points while giving a much warmer feel to the room. Again, the size and placement of windows in relation to the sun's movements ensures everything is very bright and pleasant. 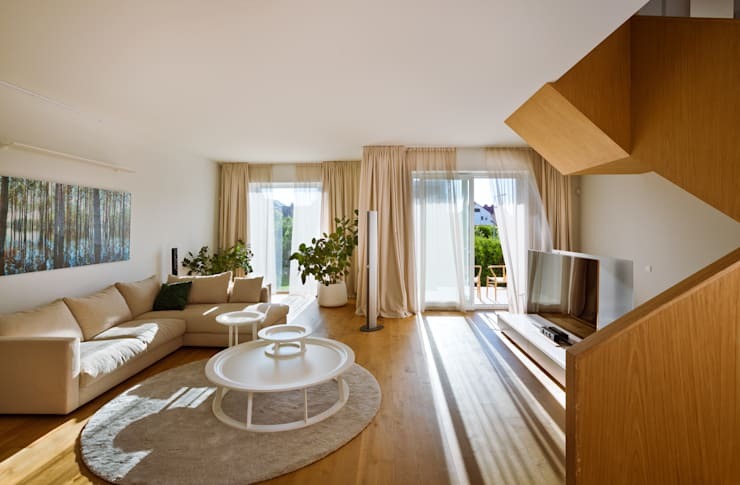 This living area promotes a feeling of serenity, with curtains blowing in the wind through the patio doors. Superior wooden flooring and a cream palette invite us to sit down with out feet up. The circular centrepiece table is very '70s throwback in style, as is the white circular rug. A huge TV and three-corner couch show that this is a luxurious place to unwind. Are you a fan of this home's cosy little garden?